In-Residence #1, the self-published magazine by Vermeir & Heiremans, will be presented at Art Brussels during 'Tables', a Flemish-Dutch presentation of art(ists’) books. 'Tables' is an initiative of the Mondriaan Fund and Flanders Arts Institute, in the context of the 20-year-anniversary of the Flanders-Holland Cultural Alliance. 'Tables' - or Tafels in Dutch - is a presentation of more than 80 artists' books and special art books from Holland and Flanders. 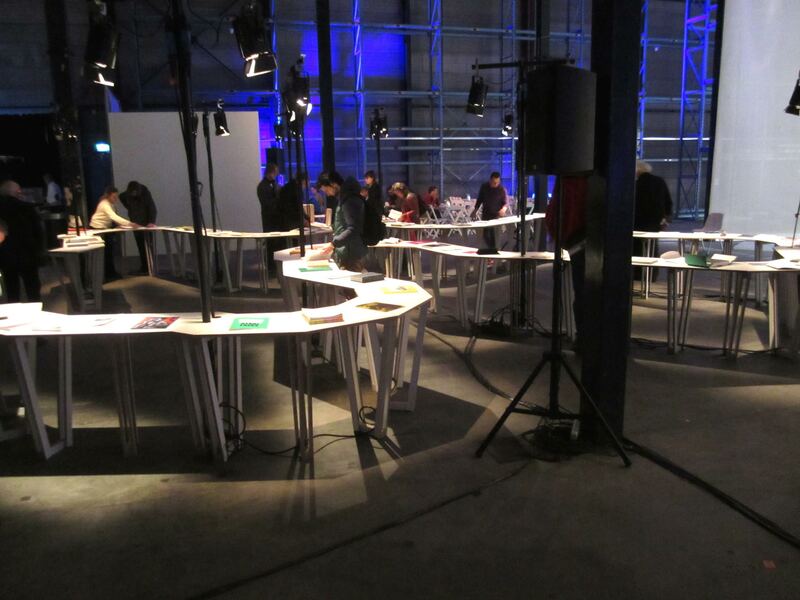 An earlier edition of 'Tables' took place during Art Rotterdam in February of this year. Maaike Lauwaert (curator, art critic) and Luc Derycke (designer, publisher) made the selection of books being presented. The presentation of the artists’ books can be seen during Art Brussels from 24 till 27 April in the Brussels Expo (Heizel). In addition, during the pre-opening of Art Brussels, from 4 until 5 pm on 24 April, people are welcome to join the speakers at the Mezzanine of Hall 3, to listen to critical statements on the importance of artists’ books and on the circumstances in which they are being created. These statements will be made by: Phillip Van den Bossche (Mu.ZEE), Nikolaas Demoen (Publisher: Posture), Astrid Vostermans (Publisher: Valiz), Johannes Schwartz (artist), Bas Vroege (curator), Johan Pas (writer and art critic) and Koenraad Dedobbeleer (artist). In-Residence Magazine #1 was published on the occasion of Vermeir & Heireman's participation in Manifesta 9 Limburg and designed by Swiss graphic designer Salome Schmuki. The artist publication – a ‘faux’ lifestyle magazine – produces a reflection on the artists' video work The Residence (a wager for the afterlife) of 2012. It contains source materials, as well as a series of articles that resulted from Reading Room, a discursive platform that was set up in collaboration with Extra City (Antwerp). Read about the upcoming publication of In-Residence Magazine #2 here.